While it might not be as well known as the Buenos Aires in Argentina, the one in south Puntarenas, Costa Rica offers a lot to its residents and tourists. While it might not be as well known as the Buenos Aires in Argentina, the one in south Puntarenas, Costa Rica offers a lot to its residents and tourists. Since it’s located just off Route 2, it’s a great starting point for travelers planning to explore the surrounding parks or a home base for those wanting to enjoy the sunny countryside. Buenos Aires recently started a new recycling program, one of only a few in the country. This has brought about an influx of new, eco-friendly residents and their families. Many retirees and expats like to buy lots and build their dream homes. Small lots begin at just $25,000. Homes come in a variety of styles and sizes, starting at around $90,000. Some feature local redwoods while others are made to look modern, in metallic shades. The majority are typical Costa Rican homes- simple, sturdy, and brightly colored. It’s possible to find luxurious homes with lap pools and wrap around porches. There are some extravagant multiple bedroom homes with exposed brickwork, balconies, and views to die for. Some local bed and breakfasts charge $20 per person and other hotels start at $49 per night. Farms, land, and hotels in need of renovation are available as investment properties. 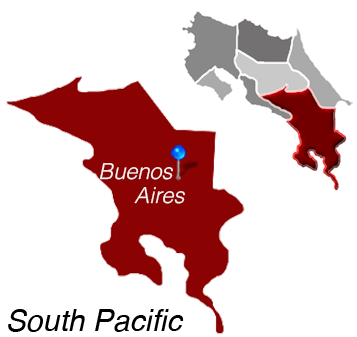 Buenos Aires is Located in the South Pacific.